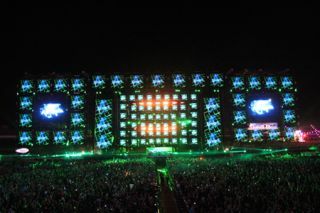 At the Electric Daisy Carnival (EDC) at the Las Vegas Motor Speedway in summer 2011, MA Lighting’s grandMA lighting consoles supported the non-stop performances playing on five stages. Show designer and director was Stephen Lieberman of SJ Lighting, Inc. A.C.T Lighting is the distributor for MA Lighting and Clay Paky in North America. - The console(s)– the thing that actually sits in front of you at the show. Big and small, there’s something for everyone. Use the big control console to program, and carry a smaller unit to play back the show if you wish. Or network two consoles and have one programmer working on LED’s and video, while another programs lighting. - Console wings and mini wings, for more faders and buttons if needed. - Ethernet network processors or nodes that allow nearly infinite expansion of control outputs and distributed processing for the whole system. This allows adding processing as necessary; the user isn’t confined by the processing power in the console itself. With hundreds of color mixing LED fixtures and digital lights that can use 250+ channels of DMX, we need processing power like never before. And who says all the DMX outputs have to be at FOH? One can now have processors in different locations, all controlled from a single location. - PC based offline editing and control software. Most allow connection to aforementioned network processors and wings to create backup or budget control solutions. - PC based visualization suites, or built-in pre-visualization of the show. - Video media servers for cued replay of video content to projectors, LED video walls and digital lighting fixtures. Most all of the major manufacturers offer digital media servers with HD resolution, tightly integrated with their console products. Or use console A with media server B – everyone is expected to play well with others. A lot of these servers can output audio too! - DMX controlled video switchers that allow routing of live IMAG camera feeds to video display devices. Wholehog Consoles Control A Variant Spectrum During the darkest days of winter, Helsinki brightens the nights in an event called Lux Helsinki. This year’s event featured a series of architectural lighting installations and fine art performances around town designed to enchant the eye and illuminate the soul. Lighting consoles from High End Systems, a Barco company, were in command of one of Helsinki’s most visible landmarks - the Olympic Stadium Tower - which was transformed into a light installation called the Variant Spectrum. Lighting Designer Jukka Huitila of Sun Effects created the spectrum of color using LED lighting fixtures and a 12-watt laser positioned on 22 balconies of the tower. Programmer Sami Rautaneva chose a Wholehog 3 console and a DP8000 to program and run the LED fixtures, set up in two universes. A Road Hog Full Boar helped with the first day’s focusing and setup procedures, and also served as a cost-effective backup. The HES consoles were provided by Tommi Stolt and Moving Light Oy. The show ran automatically throughout the evenings from Dec. 31 to Jan. 9 in durations of seven and a half minutes. Most of the players in lighting control are quite established by now – Flying Pig Systems, MA Lighting, Jands, ETC, Martin, Compulite, Avolites, Leprecon and PRG have all been producing lighting consoles and control systems in one way or another for as long as I have been in this business. There are features and specific console layouts that appeal to users for many reasons, but most often I find the dominant reason to be familiarity. Lighting programmers don’t like relearning an interface, keystroke syntax and keyboard shortcuts they have mastered over time. Seems all the manufacturers know this too. Today’s consoles are networked systems than can be scaled to suit any size production and that can control lots more than just lighting fixtures, so manufacturers are stepping up with more training. In addition to offering WholeHog training at sites around the world including London, Germany, Austria, and many locations in the U.S. the HES headquarters offers regular basic and advanced classes, along with one-on-one training on request. Wholehog instructors are HES Product Support Specialists Paul Hancock and Joe Haller. www.highend.com/support/training/Flying Pig Systems has built on their success with WholeHog II, the first large scale control product that could handle multiple fixtures from different manufacturer in an elegant fashion, adding the Hog III, Road Hog and Full Boar products. MA Lighting started with the ScanCommander, one of the first compact products that could control automated lights and conventionals as well, and have carried that through to the new GrandMA2, complete with motorized faders. I had seen motorized faders on audio consoles for years and wondered why they were not used on lighting consoles? PRG’s V676 console also sports moving faders, and also offers the 10 X 10 “century” select panel that carries over from the VL Artisan days, along with an elegant appearance and Mac-based processing. Jands pioneered an intuitive timeline-based software system in the original Vista, with the Vista L5 being the latest iteration, offering a 21” HD TFT 1920 x 1080 display while retaining the pen based system many users have come to embrace. Martin first entered the console business with the Case range of products, advanced with MAXXYZ, and is now offering the M1 control system, which incorporates those cool LCD buttons used on the old ICON control desk from Light and Sound Design (at least they sure LOOK the same). Compulite was one of the first companies to the large console party with the Animator, and are now offering the Vector family of consoles, along with Dlite, Spark and Photon products. While a lot of people think of ETC as a dimmer and fixture company, let’s remember ETC stands for Electronic Theatre Controls. From their top of the line EOS and Congo products to the Smart family of consoles, ETC takes system control seriously – they’re not just for theatre lights. Avolites pretty much owned rock ‘n’ roll touring for most of my early career with the QM500 and Diamond consoles (still analog in those days, lads), and are still going strong with their with Vision, Elite, Sapphire, Pearl and Titan products. I also spoke to a few of my friends in the rental and staging business about this article and how these lighting control products are being used on a daily basis. It appears media servers controlled by DMX lighting consoles have really caught on. It helps that many major productions are using them, so when clients ask “how did they get that effect on the Super Bowl halftime show or on the Grammy Awards” and the answer is “DMX controlled digital media servers with video projectors or digital lights”, often the next question is “can you do that?” Whether it’s for scenic elements, content on main and sub video displays or outdoor projections on architecture, is easiest to use a media server to warp and affect content on the fly to fit customer’s wishes. Seems live cameras are still being handled via switchers, either DMX controlled or manual, as the one frame processing delay common with media servers is not OK for IMAG in most cases. Even taking a feed from a presenter’s laptop and inputting it into a media server, then manipulating that content with the server is easier than traditional methods. When using digital lights such as High End Systems DL3, the media server is built into the light, and the system appears as more of a “console and lights” paradigm, with the onboard Collage Gereator effect allowing edge blending with ease. I have spoken in the past of a creative divide between lighting people and video people. Some years back I observed: “I see more lighting people jumping onto this way of working than video people”. Well, it seems that rental and staging video people have found a new job responsibility – corralling the media server(s). On bigger shows, having a dedicated person to upload and manage content on multiple servers seems to make a lot of sense. The lighting control system operator patches the servers as fixtures and provides the interface to recall content with very reliable timing, and manipulate said content to satisfy the producer. Then the video cues are all played back from the lighting console by the operator, synchronous with the lighting cues. DMX switching of video can be integrated to switch between live IMAG feeds and media server content. It was pointed out many of the servers can play back audio as well, so when video clips are recalled, there is no need to depend on audio to time everything correctly. It all just happens with one press of the “go” button. Lighting control systems have evolved from one console with a fixed amount of power to fully networked systems than can be scaled to suit any size production and that can control lots more than just lighting fixtures. By leveraging the power of the DMX control standard, we are now able to realize true “show control” topologies in our production systems. It seems that the lack of convergence I discussed in my article from 8 years ago is a thing of the past – DMX controlled digital media servers and digital lights are being used with lighting control systems on many, if not most productions. There are lots of choices in lighting control today – read the sidebars closely to see who’s doing what from the major manufacturers of lighting control systems. They’re not just consoles anymore.